If you’ve ever been to the dentist, you know that daily brushing and flossing are important for dental health. However, because flossing with braces can be more difficult and time-consuming than flossing without braces, it’s all too easy to neglect it. 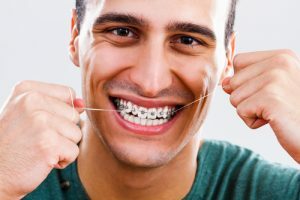 You should continue to floss daily throughout your teeth straightening treatment if you want to ensure that your teeth are healthy, beautiful, strong, AND straight when your orthodontic treatment is over. Knowing how to floss with braces will help you tackle it head on and keep up with your oral hygiene. There are many types of dental floss. It is best to use a thin, wax-coated floss when you have braces. Unwaxed floss tends to be more thread-like and can easily get caught and shredded in your braces. You may also want to invest in a floss threader, which is a small dental tool that will make it easier to thread the floss around your wires. Rinse your mouth to loosen any food particles. Brush your teeth for at least two full minutes, carefully cleaning all around each bracket. Floss the parts of your teeth that are easily accessed (that don’t require you to thread floss around the wires. Place a string of floss between each tooth and use a sawing motion to remove any loose particles. To floss the base of each tooth near the gums, thread the string of floss under the main wire. A floss threader can help you do this more easily. Pull the floss between the two teeth to the base of the gum line. Hug the floss to the side of one tooth and gently move it up and down. Then hug the side of the adjacent tooth and do the same. Repeat steps 4 through 6 with the next pair of teeth. Some teeth may have a larger gap between them while others may be quite snug. Do your best to floss between each pair as carefully as possible. Be sure to floss around the outside of your last set of molars as well. Simply hug the floss around the tooth and move it up and down. Electric toothbrushes offer much more power and are scientifically proven to be significantly more effective than manual toothbrushes at getting rid of plaque and improving gum health. An electric toothbrush can help get between the brackets and wires to remove bacteria before it becomes a problem. If you haven’t begun your teeth straightening treatment, consider choosing Invisalign® instead of braces. Many patients in need of teeth straightening will qualify for Invisalign®. Invisalign® can straighten your teeth with a better appearance, improved comfort, no dietary restrictions, a more flexible schedule, and greater convenience in maintaining oral health. Your Invisalign® trays can be removed for regular flossing and brushing, so as long as you know how to floss correctly, you will be able to continue doing so throughout your treatment. If you need help with teeth straightening or other cosmetic procedures, request your consultation with Cosmetic Dentist Dr. Kevin Sands. Dr. Sands will help you achieve the dental appearance you desire with a personalized treatment plan designed especially for you. To schedule your appointment with Dr. Sands, call (310) 273-0111 or contact Dr. Sands online today. This entry was posted on Tuesday, September 19th, 2017 at 1:34 pm	and is filed under Flossing. You can follow any responses to this entry through the RSS 2.0 feed. Both comments and pings are currently closed.